My goodness…I must apologize for my absence. It is amazing how quickly days can go by, how I can feel so busy through out each one of them and yet truly feel like I got nothing done! Why is that? This poor little site of mine has been neglected terribly and I feel bad about that. We are nearing the end of the school year and I feel like there has been a lot of school events to attend and being a mommy is my number one job. I am going to try to get my agenda back on track and hopefully get to chatting with all of you more often. I’ve recently started helping a new client and I’m excited because the nursery is for a boy. You’ve all recently seen two rooms I designed for girls, so I’m sure it will be a nice change. Here is a design I completed for a client in Hawaii who wanted a slightly nautical nursery for the upcoming arrival of her little guy. Somehow I forgot to share this design. I didn’t want the usual, navy, red and white color scheme. 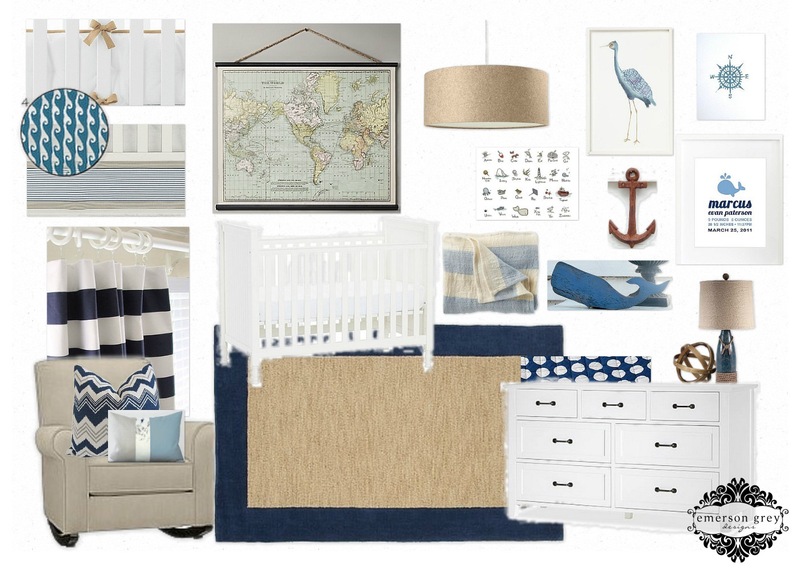 I decided I wanted the nursery to have varying shades of blue like the ocean, tans like the sand and then let the art and accessories incorporate some nautical elements.